ISLAMABAD: March 26, 2019-The Federal Cabinet has approved new Civil Aviation Policy to promote tourism and give boost to aviation industry in the country. 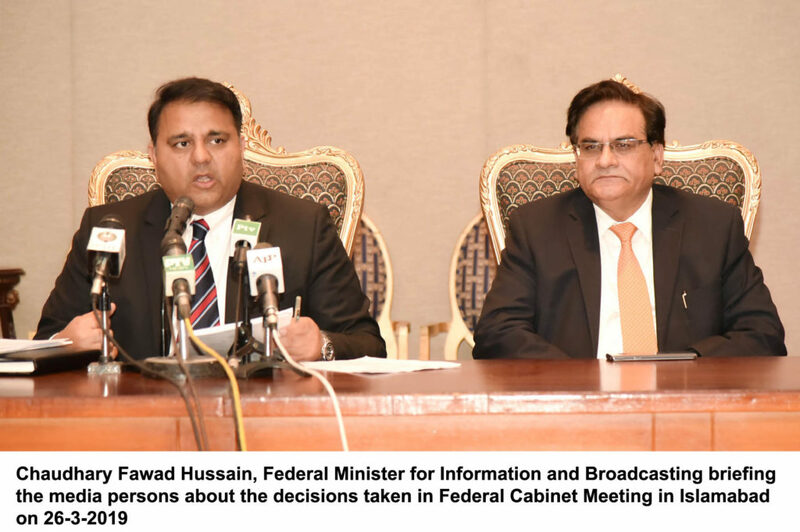 Briefing the newsmen about the decisions made in the cabinet meeting, chaired by Prime Minister Imran Khan in Islamabad today, Information Minister Chaudhry Fawad Hussain said traveling to the tourist resorts of Pakistan will be facilitated by reducing expenditures. The Information Minister said facilities, including reduction in traveling expenses and cuts in taxes, worth four billion rupees will be offered to promote tourism and there will be no tax on domestic aerial travel. Fawad Chaudhry said the Cabinet decided to review agreements with all international airlines. He said women will be encouraged to become pilots and Civil Aviation Authority will contribute up to four hundred thousand rupees in fee for the purpose. He said the duration of license of pilots has been increased to five years. The Information Minister said a new visa regime has already been introduced under the Prime Minister’s visision to promote tourism. He said E-Visa facility is being provided to five countries, including China, the United Arab Emirates, Turkey, Malaysia, and the United Kingdom. He said people from fifty-eight countries can get visa on arrival, while 170 other countries will be given E-visa facility. Fawad Chaudhry said the cabinet also approved two billion rupees Ramzan package to provide relief to people during the holy month. The Information Minister said the cabinet decided to extend Lahore-Delhi Bust Service for naother five years to facilitate the divided families. Speaking about Kartarpur Corridor, the Minister informed media persons that the Corridor will be opened in November this year for the Sikh community in November this year to travel to the Kartarpura shrine. He said in order to ensure the required arrangements and facilitate the Sikh pilgrims, a new 10-member Pakistan Gurdawara Parbandhak Committee has been constituted. Commenting on the Supreme Court’s decision of granting six-weeks bail to Nawaz Sharif on medical grounds, the Minister said the government respects the court decision. The Minister welcomed the court decision of not allowing Nawaz Sharif to go abroad during the bail period. He, however, said that the government will review the matter of placing Nawaz Sharif on exit control list. He said the government has already assured the best medical facility to Nawaz Sharif on his demand and satisfaction. The Minister said the decision of removing Shahbaz Sharif’s from ECL will be challenged in the High Court and wants consensus with the opposition on the issue of military courts. However, replying to a question, Fawad Chaudhry said the government is ready to sit with the opposition on every issue and wants to consensus with the opposition on the issue of military courts. However, it will not compromise on the process of accountability as PTI contested election on the anti-corruption slogan. The Minister said the Cabinet also decided to lift the ban on high rising buildings in Islamabad and any builder who wants to construct skyscrapers in the federal cabinet will not have to obtain permission from CDA or Civil Aviation Autority.